MULTIPURPOSE- This handheld kitchen and cooking gadget is a great gift for both beginner and experienced cooks or bakers. It helps quickly and easily grate or shave chocolate, cheese, nuts and even vegetables! 3 DRUMS INCLUDED- This manual crank rotary grater comes with three different drums for coarse or fine grating and shaving. This allows you to add a nice final touch to salads, pasta dishes and even deserts. EASY TO OPERATE- The shredder is easy to assemble and operate. 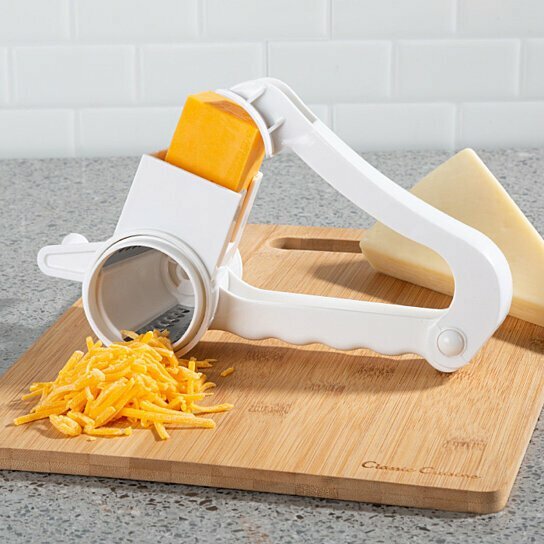 The handle doubles as a plunger to safely press and feed food items into the grating and slicing drums to prevent injury from slipping. EASY TO CLEAN- This handy kitchen accessory is a breeze to clean! Simply hand wash with hot soapy water and a brush, or place it on the top rack of your dishwasher to keep it ready for your next dish. PRODUCT DETAILS- Materials: Plastic and Metal. Dimensions: 7 " L x 5 " W x 3.75 " H. Color: White. Includes 3 Grating Drums.